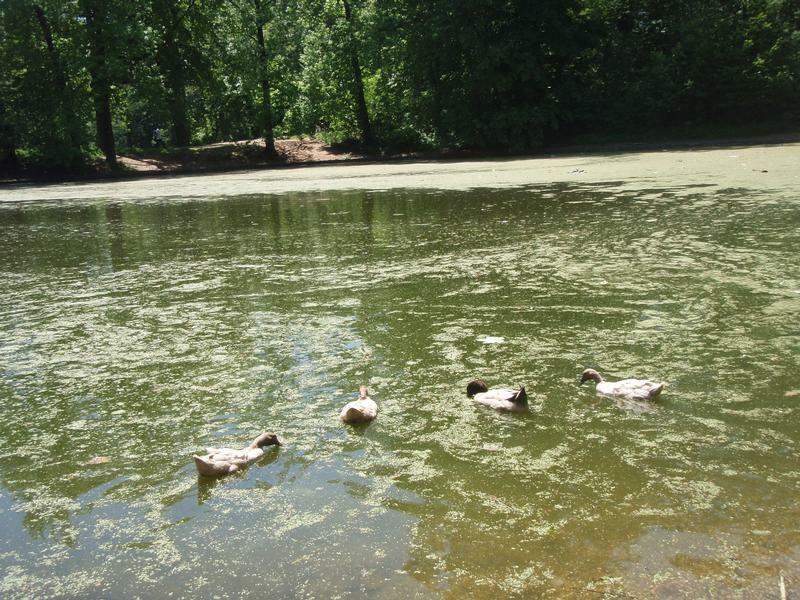 “What would you call a new species of duck, found only in Prospect Park?” This is a question that Milena Popov, a teacher-naturalist with the Prospect Park Alliance, likes to pose to her tour groups—and not just rhetorically. Lullwater Lake near the Audubon Center at the Boathouse is believed to be the only place in New York City—and beyond—that is home to a hybrid duck that was originally born of a female American black duck and a male mallard. “Right now we just call them ‘the hybrids,’ but if they continue to produce new generations among themselves, then they will be formally classified as a new speices and we will need a name for them,” she explains. The exact population is unknown, but currently there are about 10 on the lake. They mostly mate among themselves, but for reasons that have not yet been studied, they don’t nest or take care of their eggs so each generation is a welcome surprise that adds to the suspense over potential specieshood. The tale of birds and other living organisms adapting and thriving in a new environment is as old as nature itself, and among the more dramatic examples that Milena points out is the European starling, a.k.a. the trouble maker. In the 19th century, 19 of these small, aggressive birds were brought over from England in an effort to introduce to the new world all birds mentioned by Shakespeare. The small flock was released in Central Park and ultimately caused an imbalance in nature. “Since this easily adaptable bird has no natural predators in Northern America, it spread out very quickly and became one of the most common birds in the U.S. today. It always stays in large flocks and chases native birds away wherever they settle,” Milena says. Our 9-year-old son Riley has loved birds and pointed them out with volume and vigor ever since he was a baby. When he was just a few months old, we started calling him The Ornithologist and over time he learned how to get us to see the most thoroughly obscured bird without actually scaring the creature away. Among his favorite bird books are A Take-Along Guide: Birds Nests and Eggs by Mel Boring, Birds: Open Your Eyes to a World of Discovery by Eye Wonder guides, and The Backyard Birdsong Guide, A Guide to Listening by Donald Kroodsma, an incredible text that, at the push of a button, plays one of 132 crisp audio clips of birds vocalizing. We think that children are never too young to go birding, formally or informally, and judging by the recent tour we took in Prospect Park, other parents certainly agree. We were a group of about 20, with the youngest around six months old. Everyone, including the baby, received a sturdy pair of binoculars and off we went on the stroller-friendly Waterfall Trail, which starts near the Audubon Center. The thickly wooded path is paved throughout and has a few gentle hills that showcase a number of waterfalls designed by Frederick Law Olmstead and Calvert Vaux, the legendary 19th century landscape architects who developed Prospect Park and many others. 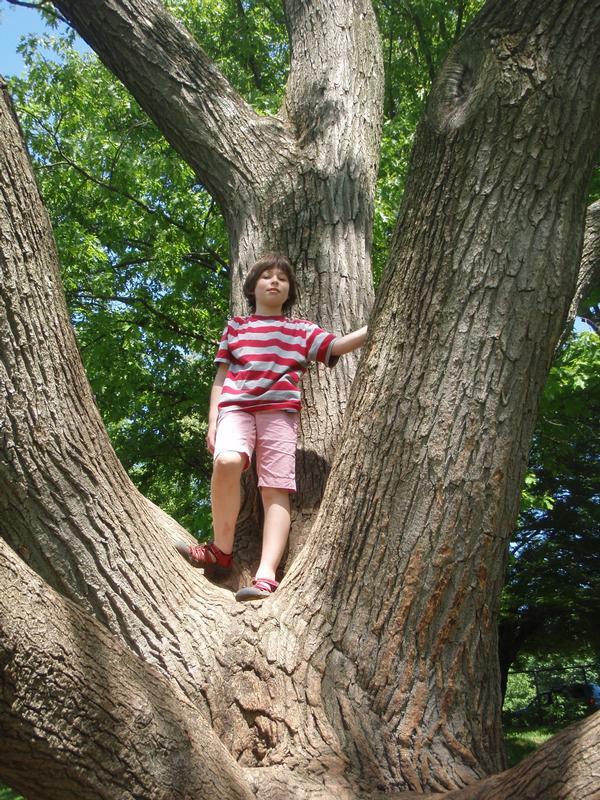 The Prospect Park Alliance holds free Discovery Tours that focus on birds, trees, and broader topics such as human impact on nature every Sunday—rain or shine—from 3 p.m. to 4 p.m. throughout the year, except in January, when the Audubon Center is closed. The tours are led by trained teacher-naturalists such as Milena, who is an adjunct science professor at Brooklyn College and is currently writing a doctoral thesis that will bridge ecology, art, and politics. Among the species her expert eye and patient hand pointed out to us were the American robin, blue jay, northern cardinal, gray catbird, red-tailed hawk, red-winged black bird, and of course the European starling, “the hybrids,” and mallards. Prospect Park has about 250 species of birds, including the house sparrow, black and white throated sparrows, common grackle, Baltimore oriole, great egret, black-crowned night heron, great blue heron, mute swan, herring gull, ring-billed gull, ruddy duck, Canadian goose, double-crested cormorant, downy woodpecker, rock pigeon, and barn swallow. In winter in particular, visitors can see the American coot, mourning dove, northern cardinal, black-capped chickadee, and all sorts of nuthatchers, woodpeckers, and preying birds. Birds such as kinglets and warblers can be seen only briefly during the spring. A mong all the birds we saw on our afternoon excursion, we continue to discuss and root for “the hybrids” the most. In our view, if area vibes are anything to go by, “the hybrids” will prevail and perhaps become as as big a draw as the nearby Camperdown elm, which was planted near the Boathouse in 1872. This massive, weeping elm has a genetic mutation that makes it grow horizontally rather than vertically. It is about 12 feet high with a thick, knotty trunk, and long contorted branches that stretch out in a wide and wonky circle. It is the offspring of an elm that first displayed the mutant growth pattern nearly two centuries ago in the forest of Camperdown House in Dundee, Scotland. A cutting of this unusual branch was successfully grafted to the trunk of a wych elm creating a lineage that endures today. By the middle of the twentieth century, the tree was suffering from decay and was slated for removal until the poet Marianne Moore raised funds to have it saved in 1967. The tree remains firmly rooted and protected by a fence just south of the Audubon Center.